I had someone email me from Australia and wondered if I would ship to them. I told them that shipping was so prohibitive to ship overseas I had never done it, but I would check it out. Well, many of you may know this but I didn't and there may be some of you that don't know like me. If you have an item or several and they do not weigh over 13 ounces, you can ship them first class parcel. Well, mine only weighed about 6 ounces and I was able to send them to her for only $6.50. wow, I was excited and I made a sale! I shipped in a bubble envelope I purchased from Walmart. Now I talked to the young girl at my post office here in Alabama and she told me the countries, she found with the best shipping within the country are Canada, Great Britain, Australia and Japan. She said Italy is bad and that she heard from her customers that their post just throws the packages in the street! She recommended that I not ship to Italy. Sorry, if I have any readers from there. So I think I will change my listings and I will ship to these countries she recommended. Just thought I would let you all know my experience. Now how long it takes for her to receive it, we shall see. My post office says about 10 days. Will let you know. About a third of my sales are international. Of those, about 1/2 of them are UK and Australia, the other half is Canada. Never had any problems with internationals. Looking for something special?? Click here and search the old farmhouse! 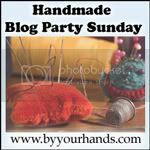 Stop over to "By your hands" Great Giveaways by talented artists and a whole lot more. Are you a wannabe writer? Need your MS critted. Critique Circle is a great place to start. Free Membership or become a premium member.